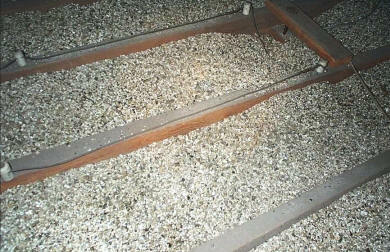 Dealing with asbestos contaminated vermiculite is a difficult job that requires a DFW asbestos removal professional. In some cases the affected material must be removed, and in other cases it may be best to leave it where it is while following certain precautions. The good news is that vermiculite is fairly easy to spot. If your insulation is loose and pebbled and looks like miniature packing peanuts or foamy gravel, you likely are stuck with vermiculite. It may be poured within cinder block or framed walls, or it may be found spread between rafters in attics or under flooring. If you think you’ve found potentially dangerous insulation in your property, call 214.989.4044 to speak to an asbestos abatement contractor about the problem. Your property should be tested to properly evaluate the situation. The most important rule of thumb to follow after discovering vermiculite insulation in your building is to not disturb it. Asbestos becomes a danger when it is airborne. This is why, in some cases, the safest solution is to not remove affected insulation. The act of removal itself may cause a contamination if not handled properly by a professional. An asbestos removal contractor can help you take precautions to protect your home or office if it is found that contaminated insulation is best left undisturbed. It’s hard for many to believe, but asbestos is still legal in the US today. For more information on that shocking fact, check out this blog about why asbestos is still legal written by a contractor providing asbestos abatement in Denver. Asbestos is a problem that’s not going away anytime soon. To ensure that your family or your employees are protected from a vermiculite insulation contamination threat, contact us today.